“In Cambodia, we cheers to make closer friendship,” said a local Khmer. 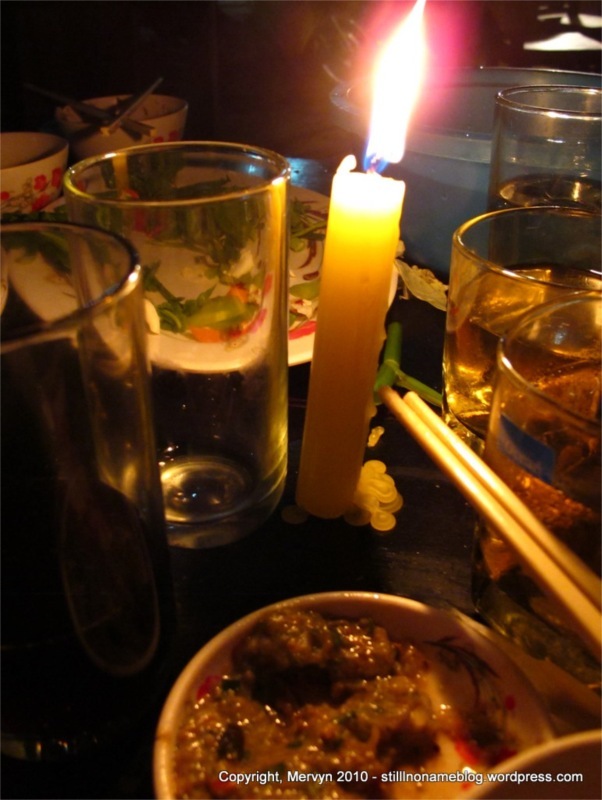 I looked at my half empty glass and the Khmer people dancing, talking, and yelling around me . If toasts make closer friends, then my twenty closest friends are all Cambodian. It’s the last day of the Khmer new year or Chaul Chnam Thmey, a three day celebration of the end of the harvest. Like the Thai new year, it has its roots in Buddhism. Here, though, the emphasis doesn’t seem to be water but on beer. If this first day in Cambodia is any indication, the country is absolutely mad—and I love it. The day technically started at midnight. I was awake packing, writing, and reading about crossing the overland border between Thailand and Cambodia. Before I knew it, it was 3 a.m. The bus station opened at 3:30 a.m. If I wanted, I could just stay up and catch an early bus to Aranyaprathet, the Thai town on the Cambodian border. I took a short nap then prepared all the documents and other paraphernalia I’d need to make the journey. You might think a bus terminal at 5 a.m. the day after Thailand’s biggest holiday would be pretty quiet. You might think wrong. Mo Chit bus terminal, Bangkok’s northern bus station, was packed with people departing for remote parts of the country or arriving on long haul buses. People stood on the large street in front trying to hail cabs or local buses into the city. My cab driver negotiated the traffic and dropped me off across from the station on a busy road saying I could take the footbridge over on my own. People were already climbing into the cab before I could get out. I crossed the footbridge to the bus station. I found the ticket window, accidentally overpaid by 8 baht (220 instead of 212, since I misunderstood the lady), and boarded the 5:30 a.m. bus. I was one of 8 passengers, none looked farang. I slept intermittently. When we neared the Thai border, a Thai soldier hopped on and checked passports. He scrutinized those of two older Filipinos. When he saw the blue jacket of my U.S. passport he just waved at me. The bus dropped us off at a market at 9:30 a.m. As I stepped off, my glasses immediately fogged up because of the heat and humidity. I searched for a tuk-tuk driver to drive me the remaining 16 km to the border. Whenever I asked a driver to take me to the border, they waved me off towards the main road. I’d move on and ask another driver closer to the road for a ride to the border. Same response. I began to wonder if I was missing something. Where could I find drivers willing to go to the border? I turned left on the main road and ran smack into the immigration checkpoint. No wonder the tuk tuk drivers looked at me funny. Turns out the website I consulted is a little out of date. The bus from Bangkok no longer drops you off a few miles from the border. Instead it takes you all the way. I marched through Thai immigration and started to look for the Cambodian immigration office to purchase a visa. Before I could even start looking, a Cambodian man asked me if I needed a taxi to Siem Riep. Mind you, I was still technically in Thailand. I waved him off and marched on. He followed me, repeatedly asking me what I was willing to pay. I insisted that I’d find something once I crossed the border. He gave up and pointed me to a quarantine office to fill out a Cambodian medical form. I half expected a scam, since I’d read that on overland crossings, Cambodian immigration officials sometimes try to get you to pay them money in order to get past a health screening. No issue this time, though; after filling out a form, the officers let me through. Sleepless, hot, and pouring sweat from hauling around my bag, I walked further down the main road looking for the visa office. Hungry, I stopped for a bite at an outdoor restaurant. I sat down and watched a cast of shady characters mosey in and out for a bite to eat. They looked like the sort of people that’d you’d expect to skulk around Poipet, the shithole of a gambling town on the Cambodian side of the border. Muscled Korean guys with tats, skinny hunched Asian men, a chatty White guy in a Hawaiian shirt. I opted to put on my contacts because my glasses kept slipping down my sweaty nose. Something told me I might need better than 20/5,000 vision to make it through to the other side. After scarfing down rice and chicken, I pulled on my pack and continued my search. I walked back and forth down the road, looking for what my research suggested was a large white building. I asked guards where I needed to go and they pointed back where I’d come. That’s when I spotted the White people. Following Rule [INSERT RULE NUMBER] I headed towards the group and discovered that the visa office is right next to the quarantine office in the same small white building. It’s like I was trying to get myself lost. I paid the $20 visa fee, plus 100 baht in grease money the guard asked for. I was more hot and tired than I was principled so I didn’t put up a fight about the bribe. While waiting for my visa, I overheard a tall Czech girl talking to a British couple about finding a bus to Siem Riep. I interrupted and asked if they wanted to share a taxi. A slim Cambodian tout with long finger nails joined me in intruding on conversations and offered his services. After a bit of haggling, he said he’d get us a cab for ten bucks apiece for a non-association cab to Siem Riep. I thought this was a pretty good deal because I’d heard that association cabs cost considerably more. He even offered to let us check with the association office to see if his price was better. After considerable debate, the others finally agreed to share the cab. There was some confusion about changing money, but I insisted that I cover the cost of the cab in dollars and that the others could pay me once we hit Siem Riep. We finally trudged off to the Cambodian immigration intake office. We sweated our way through line then met our tout on the other side. As we rode the free shuttle to the bus and taxi station, he briefed us on the plan. We’d get off the bus, then go up to the association taxi window and ask about the price. We’d tell the ticket people that it was too expensive and walk out of the station. The tout would discreetly follow us out of the terminal and join up with us a block away. Guess, the cab association that holds a monopoly on cab business doesn’t look kindly on people using non-cartel cabs. All went according to plan. I asked about the taxi prices and the association told me it was $15 per person. I pretended to consult with my new traveling buddies then we walked out of the station. “1 million dollars,” I replied. I waved my hands. He kept asking about price. I kept saying too expensive. Then he stopped, pointed at a Toyota Camry, and said that this was our taxi. I played along and said my line. The others caught up and were thoroughly confused. I said that they should just play along. The tout asked where we were from, we answered, and the cop wrote down something on his hand. We loaded our bags into the trunk then piled in. The Cambodians continued to talk outside. At least in the car we had air conditioning. The cop left and driver got in. He was about to leave when the tout poked his head in and they had another animated discussion. The driver then gave the tout some money. The tout leaned in and said, “I had to pay the driver $80 in front of the police. Now I have to take the money back.” He laughed maniacally. No wonder the cab driver looked so confused. With that, we were off. The road to Siem Riep used to be a muddy mess. Now it’s a sealed, paved road. Other than the signs in Khmer, I wouldn’t have known I’d left Thailand. The road blasted straight through the flat country side. We passed groups of kids walking down the road–where they were walking to and from I couldn’t tell. There were no buildings ao far as I could see, just open fields and plains. When we hit Siem Riep, the driver stopped and said we had to switch cars. The others were already on edge from the whole border experience. I wasn’t that worried since I hadn’t paid the driver. If they wanted to run game on us, I’d just knock something off the price of the cab. A Cambodian named Lai told us he’d drive us into town. He said he’d already paid the driver and that we could pay him when he dropped us off at wherever we wanted. When we asked why he’d drive us into town for free, he said, “I want to get work from you.” I liked the honesty. The others were a bit more cynical. I have a feeling I should adopt their attitude. I had lunch with Collin and Haley, the British couple. They’d just gotten married in Thailand after being together for 11 years. No family or friends had attended their beach wedding because the trip was too long; that suited them fine. They were on a month-long trip through Southeast Asia on their honeymoon. Honeymooners cruising through Asia on a backpacker’s budget. I liked them already. We headed to our rooms to crash. I slept the ugly sleep of someone who’d been traveling all day. When I came to, I could hear a party going on outside. Earlier, Lai had said his friend had bought a cow to celebrate the last night of the Cambodian New Year. He said all hostel guests were invited to the party. I was starving and hadn’t had dinner so I wandered downstairs to see about the cow. 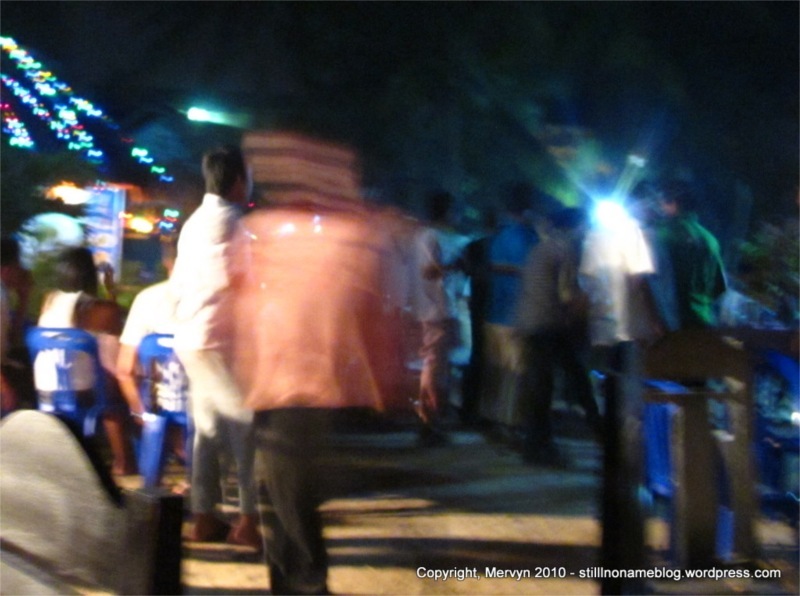 The proprietor had set up tables, chairs, and a sound system in the hostel’s dirt driveway. Candles were melted to the table tops for light. A few travelers were mixed in with the Khmer, but I didn’t see Collin or Haley. Lai picked me out, offered me a chair and a glass. He filled it with ice then poured me a measure of stout. Lai, his friends, and I toasted. Then we feasted on barbequed sliced beef. 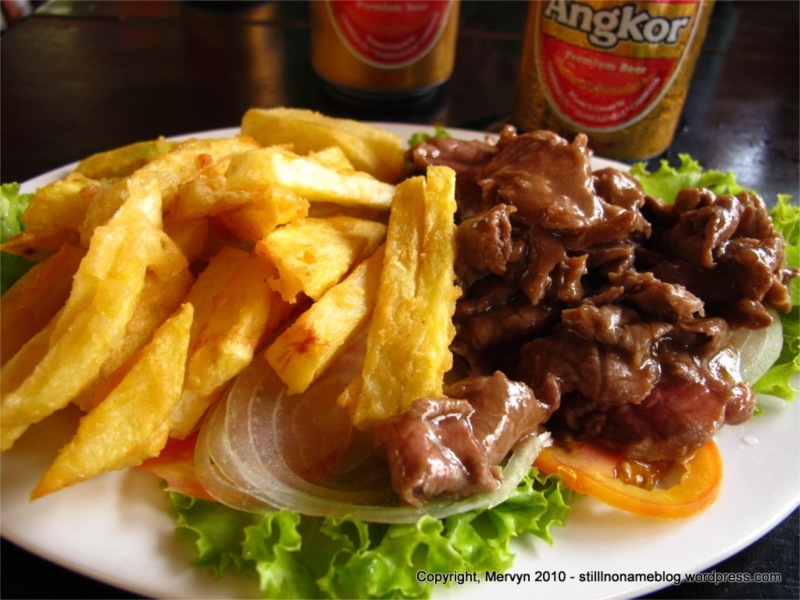 We picked at the pile of meat with chopsticks, dipping the medium rare strips in a Khmer sauce of some kind. We used our hands to grab cut vegetables to dip in the sauce. Anytime anyone came to the table, we toasted, drank, then refilled our glasses with beer and ice. Anytime anyone said something funny, we toasted, drank, and refilled. When more food arrived, we repeated the process. When someone made eye contact with someone else, glasses rose, and another round would ensue. One time, I put my glass down to eat and, when I picked it back up, everyone took it as a sign to toast and drink. I swear to you, I participated in more toasts that night than I have in my entire life. We were making some seriously close friendship. Other than a handful of tourists, it was nearly all Khmer men. A mix of Western and Khmer music blasted through a sound system. Guys kept dragging me out to dance. Some shoved me towards other tourist women. Everyone carried a glass and raised it high and often. Collin and Haley joined us as they returned from a trip to the night market. They were fascinated by the beer on ice. They joined in on the toasts, though Haley just raised her glass since she doesn’t do beer. The party carried on as Collin and Haley headed to bed. The music shifted to heartbroken Khmer love songs, which some of the men belted out at the top of their lungs. One of the guys smashed a glass into his head and cut himself. Lai leaned over to me and said, “He’s a tough guy,” snickered, then went back to singing. Just 24 hours ago, I was in big city Bangkok leaving a Red Shirt rally to get a massage. In that time, I’d crossed over into another world. A crazy, mad world. A world where everyone’s running game. A world of long nailed hustlers and never take “no” for an answer touts. A world where men drink, feast, dance, and sing love songs.